This wonderful creature I sold during my Christie's time in December 2006. He has a felt face and torso. Wonderul oily-clear and black glass eyes with brown painted backs, these are very typical of good quality early post WWI British toy production. He has painted features, which is used on Harwin dolls (the ones which were copies of early Steiff dolls). 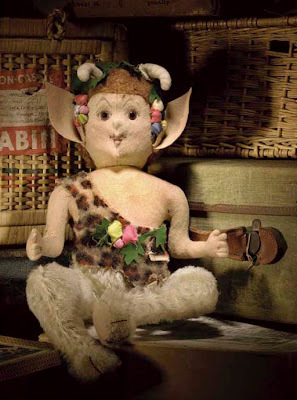 He has a ginger mohair wig and felt horns, the head swivels. He has fixed arms, but his legs are jointed white mohair deer legs bent at the knee with felt pads. Silk flowers decorate the hair and the `leopard fur' patterned mohair skin garment. He is 20.3/4in. (52.5cm.) high and dates from around 1914. The Faun, which is associated with Satrs, but are know to be more gentle, are mischievous creatures with the legs, ears and tail of a deer and the face and body of a handsome man. They follow the god Faunus and can cause nightmares. At times, they can also be quite cheerful. This is probably one of the strangest toys I have sold, I doubt you will see another one. I thought he was wonderful and would have loved to own him. Do you like or hate this chap?